The 2016 Chevrolet Malibu Hybrid made its big premiere today at the 2015 New York International Auto Show, and it represents not just a small step, but a giant leap forward from its predecessor. While the EPA has yet to verify these numbers, Chevy claims a combined fuel economy to the tune of 47 mpg, compared to the 29 mpg achieved by the 2009 model year car. 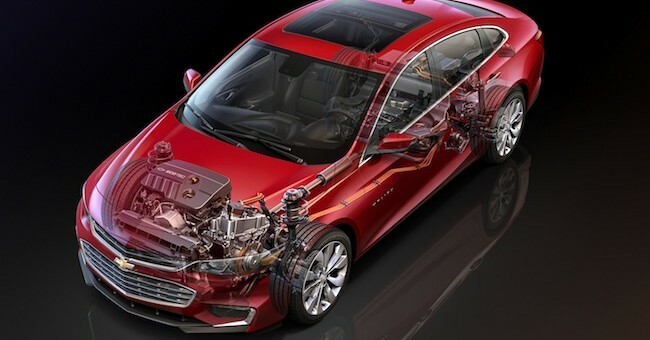 But by far one of the niftiest improvements for the 2016 Chevrolet Malibu Hybrid is its new Exhaust Gas Heat Recovery system (EGHR). This isn’t just Chevy’s first application of the system, but it’s relatively new to the industry, as well. No, the EGHR system on the new Malibu Hybrid doesn’t generate electrical energy from waste heat to recharge the battery. That’s a newly emerging technology likely several years out from seeing widespread implementation. Instead, the electrified Malibu uses waste heat to warm the cabin interior as well as the engine, raising the latter to peak operating temperature quickly, and keeping it there. While that may all sound underwhelming, the boost to fuel economy – especially in the colder months – is measurable. It also allows for a further reduction of NO2, almost as big an opponent to clean air as carbon. The EGHR system in the 2016 Chevrolet Malibu is kind of like that old Native American principal of using every part of the buffalo; what once was waste is wasted no longer. Previous story Could The 2016 Chevrolet Malibu Be The Next Generation Holden Commodore? Next story 2016 Chevrolet Spark: Hot Or Not? GM calls the battery a battery system. I can’t wait to hear what’s in the “system”. Waste heat has always been used to warm the interior of cars, so nothing different here. My 1999 tercel has always gotten 48 miles per gallon so nothing new here either! My 1987 VW jetta got 53 mpg. An exhaust gas heating system is only going to help with the first few minutes so will do very little if you are driving more than about 10 km. One the engine is up to temperature, it has always been kept there by the thermostat that is on every car ever manufactured…..so I am left a little baffled by this ‘wonderful new breakthrough technology’ claim.